William Tyndale, "Angliae Apostolus", humanist, translator, and Protestant martyr, was born about 1494 in Gloucestershire. He was educated at Oxford and Cambridge. About 1522 he planned to translate the Bible. After church authorities in England prevented him from his project he went to Germany in 1524. He landed at Hamburg and soon left for Wittenberg where he was registered under an assumed name (Guillelmus Daltin ex Anglia) at the university. Despite some controversy there is now little doubt that he met Martin Luther who was also in the city at that time. From Wittenberg he moved to Cologne where he completed his New Testament translation in 1525. The printing was begun at Cologne but, when Catholic authorities suppressed it, carried out at Worms in 1526. The first copies were smuggled into England in the same year. Church authorities burned all the copies they could trace. Of the Cologne edition only a single fragment has survived, of about 6000 copies of the Worms edition, only three (British Library, St. Paul's Cathedral Library, Württembergische Landesbibliothek Stuttgart). Tyndale never returned to England and spent the rest of his life in Antwerp where he began the translations of the Pentateuch, Jonah and the historical books (from Joshua to the Second Book of Chronicles). 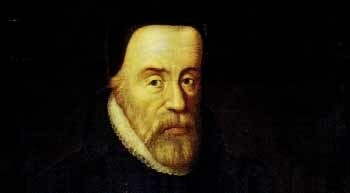 Tyndale's translation was the basis for the King James Version of 1611. In 1535 he was accused of heresy and imprisoned at Vilvorde near Brussels. There he was strangled and burned at the stake in 1536.
by the Scribes and Pharisees, etc. The Testament of Master William Tracy, Esq. how they come up and were institute, etc. Donald J. Millus' Tyndale site.